DOYLESTOWN, PA - July 26, 2010 - WastewaterPR.com - Penn Stainless Products has received an Export Achievement Certificate from the Department of Commerce. U.S. 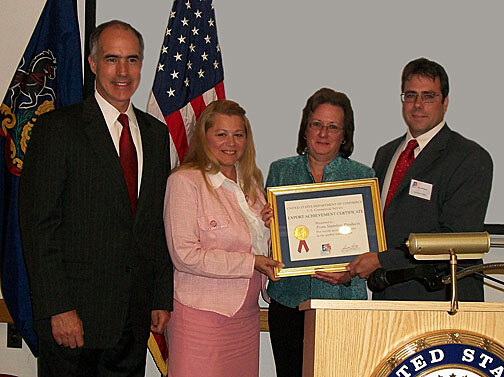 Senator Bob Casey (D-PA) presented the award to Penn Stainless at the Export Development Workshop in Breinigsville, PA on July 19, 2010. Pictured (from left) are U.S. Sen. Bob Casey, Jacki Smisko, Penn Stainless, Export Sales; Lynn Boyle, Penn Stainless, Shipping, and Jason Martineau, Penn Stainless, National Sales Director.